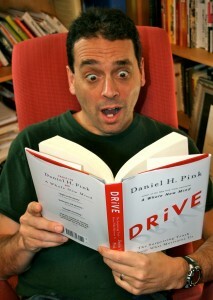 I just read “Drive” Dan Pink’s (www.danpink.com) new book focusing on what motivates us! It reminds me of two of my core value’s, watch what people do vs. what people say? (that’s including myself), then think about what makes them (me) tick/why? I’ve achieved allot in my life and I’m only 39 years old, 4.5 years ago I jumped out of the corporate world, I knew I was not doing what I loved nor what came easily to me. My Motivation for achieving and doing what I did was driven by my need to survive not to thrive! The KEY was Motivation! If anyone out there feels like they keep achieving stuff and still feel empty this is your book! Short term motivation vs. long term satisfaction. Dan highlights “the breach between what science knows and what business does”. If you like statistics based on research this book will flabbergast you at just how much we know to be true and how little of it we do? It took me a long time to realise that I could question my reaction to something! That my reaction could stem from what I was taught vs. what I believe within me to be true? Dan highlights that the “profit-maximization principle” (the they control companies) IS being replaced by the “social-benefit principle” ( the we autonomy companies) and he provides endless researched evidence to back up his thinking. I don’t know about you but now when I decide to do something I want to know who and what’s driving it! not to mention where its taking me? If you have a deep-seated desire to direct your own life, to extend and expand your abilities. Living your life on purpose and believing in what you do, then “Drive” will guide as a reference to keep playing to your very own strengths! For those of you that are not big readers (right brainers be aware) I’m hoping Dan comes up with one of those simple little reference books. Oh and I’d be super interested in hearing a discussion between Dan, Kathy Kolbe, Don Riso and Russ Hudson. I’m reminded of Ken Robinson’s TED talk Do schools kill creativity? Perhaps we can have a lesson focused on what motivates our children, the “what do you LOVE to do” class? Thank you Lydia Hirt for sending me a copy of this book, it is indeed a paradigm-shatter er! Previous post: what is it that motivates us?